Bibimbap (or Bibimbop) is a well known Korean dish. Like most of Asian dishes, Bibimbap is served as white rice topped with soy sauce, doenjang, seasoned vegetables or chili pepper paste. Bibimbap goes really well with raw or fried eggs and sliced beef. Most Bibimbap recipes have beef as an additive, but in coastal regions of Korea Fish is used instead (Hoedeopbap). Usually in Hoedeopbap has tuna, salmon or even octopus as an additive. Lots of vegetables are served with Bibimbap. Common ones are zucchini, daikon, mushrooms, spinach, soybean sprouts, tofu and lettuce. Depending on the taste, other vegetables are also included: paprika, tomato or onions. 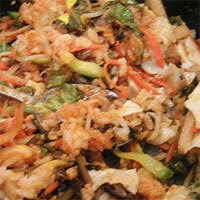 Bibimbap is contains a considerable amount of fat and nutrients, therefore not suitable for a diet. The calories in Bibimbap per 466.7g(1 serving) is 593 calories. Bibimbap is calculated to be 127Cal per 100 grams making 80Cal equivalent to 62.99g with 67.62g of mostly carbohydrates、27.12g of fat、17.55g of protein in 466.7g while being rich in vitamins and minerals such as Molybdenum and Vitamin K.